The story of Scrooge is one the most memorable Christmas tales. 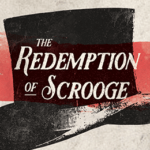 Dickens shares the story of a person who, through a series of good and bad experiences, has deemed Christmas as “humbug” (fraud) and refuses to embrace the joy and good tidings of the season. Through a series of encounters with “teaching spirits” Scrooge is reminded of what the season means and what he can do to change how he perceives and celebrates it. Is Christmas a time of joy or stress for you? Does it serve to remind you of the things you have lost or does it give you hope for the things to come. Understanding where our joy originates and how we can reclaim that during times of stress and trial are key components in the lesson this story communicates. As we harken back to the original Christmas story (Jesus’ birth), what parts of the story remind you of the joy and hope we should carry. What do you think was the main point of Matt’s message? What is your favorite part of the Christmas story? Why? What parts of your current Christmas traditions bring you joy? What parts create stress? What can you do to help initiate that joy in your spheres of influence? Consider practical ways you can tap into the joy of this season. Identify the things that bring you joy and formulate creative ways to practice and communicate that joy/hope to everyone you come in contact with.